With Windows 8, Microsoft introduces a brand new interface that feels designed more for tablets than for laptops and desktops. 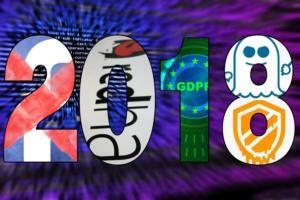 We'll help you find your way around the new OS and make the most of its features. 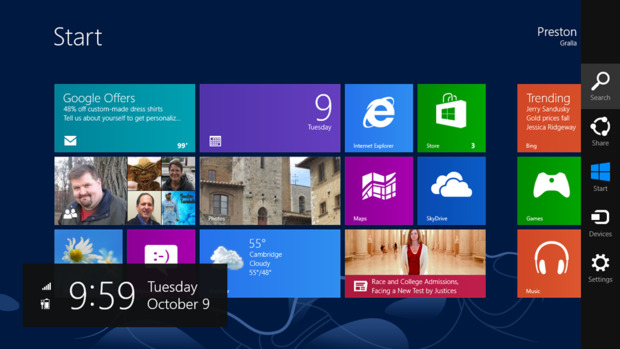 When you start up Windows 8 or wake it from sleep, you'll get your first inkling of the changes the new OS brings. The new lock screen sports a big graphic image and displays changing information such as the date and time, the local weather and the number of new emails you have. 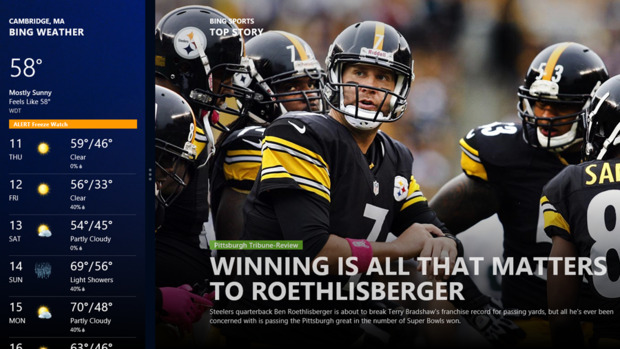 This slideshow accompanies our story Windows 8 cheat sheet. Click through to that story for many more details about working with the new OS. 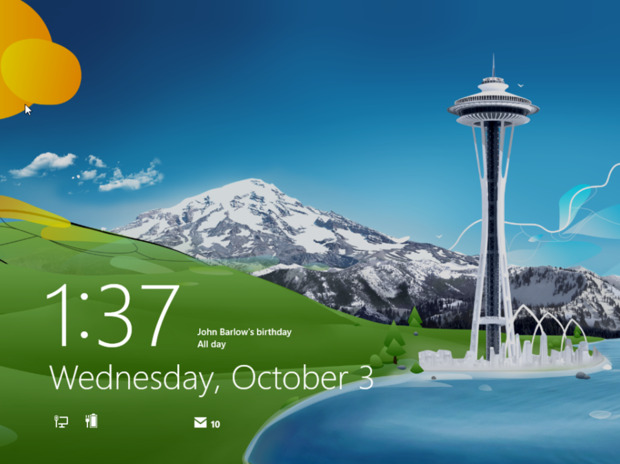 The Start screen is the new face of Windows. It's made up of a grid of colorful tiles, one for each app. Click a tile to run its app. You'll see tiles for a slew of new, lightweight apps built into Windows 8 as well as traditional applications like Microsoft Word. 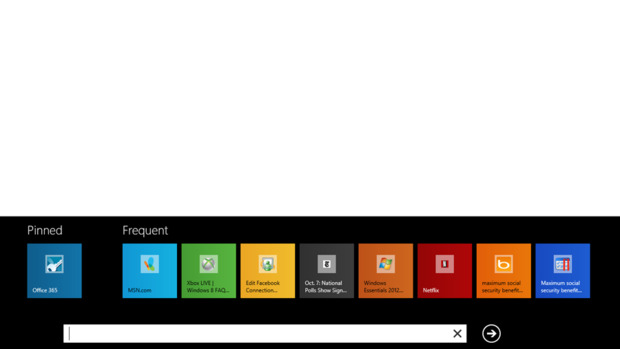 Even the Windows Desktop is accessed via a tile. Some apps grab real-time information (such as upcoming events in your calendar) and display it as notifications on their tiles. The new Charms bar on the right gives you quick access to search, system settings and more, and you'll use the scroll bar at the bottom to reach tiles that are located off the right edge of the screen. 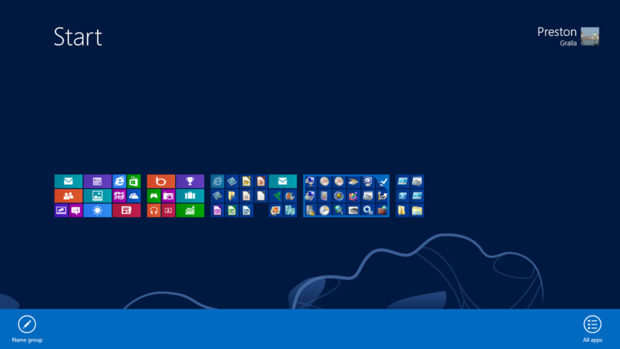 No longer front and center, the Desktop is reached by clicking the Desktop tile on the Start screen. 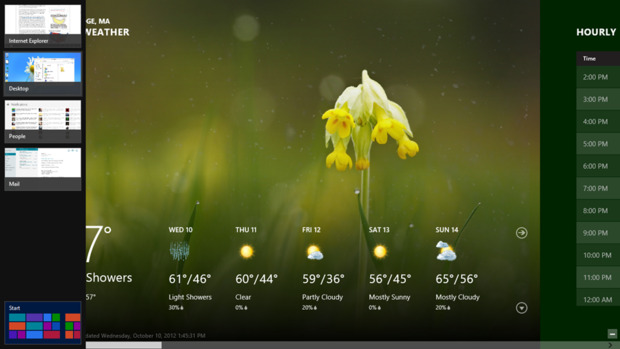 When you get there, you'll see a visually simpler, flatter interface than in Windows 7. And one major navigational feature, the Start button, has been removed. 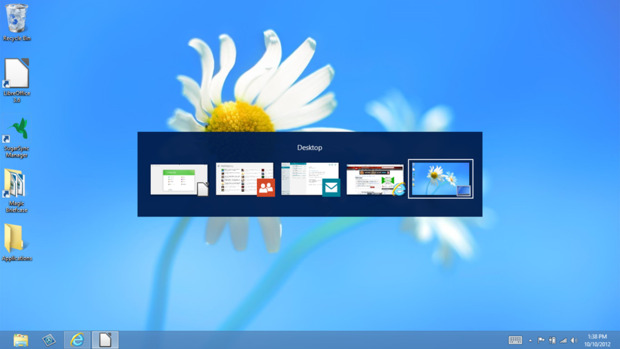 Otherwise, it behaves pretty much like the Windows 7 Desktop, with icons for launching your traditional Desktop applications and a taskbar that shows currently running apps. 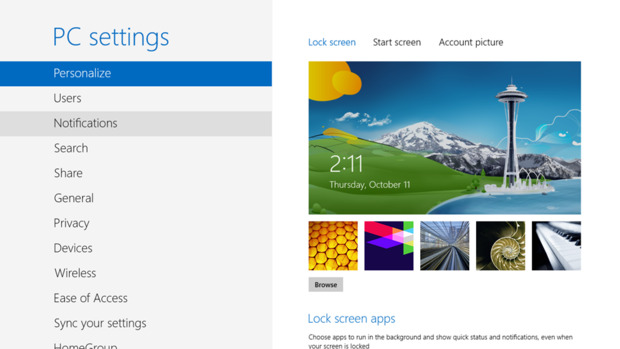 Note, however, that you can't run the new Windows 8 apps from the Desktop. You can get to the Charms bar no matter where you are in Windows 8: Press the Windows key + C on your keyboard, or swipe from the right edge of the screen toward the center on a touch-screen device. The Charms bar appears with five charms on a black background: Search, Share, Start, Devices and Settings. The Start charm in the center of the bar acts as a toggle: Click it to go to the Start screen or, if you're already on the Start screen, to go to your previous location. We'll explore the other charms in upcoming slides. Here's where you search for apps, files and settings. Just click the appropriate item in the pane on the right and type the first few letters of your search term; the results will appear on the left side of the screen. You can also search inside any app (such as searching for emails in Mail) by selecting it in the right pane and typing a few letters. To start a search from the Start screen, you don't have to manually launch the Search charm. Just start typing, and the Search charm appears with your text in the search box. Some of the new Windows 8 apps include a built-in Share feature that lets you share information from the app via email, social media, SkyDrive or messaging. For example, the Photo app can share via Mail and SkyDrive, and the Music app lets you share via Mail and the People app. 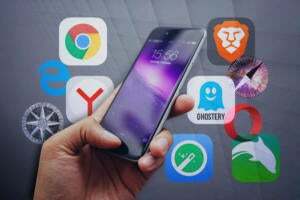 At this point, not many apps support the Share feature, and of those that do share, not all can share in all ways -- it's up to the app developer to decide. This charm is context-sensitive, so what appears when you click it depends on what you're doing at the time and what kind of devices you've connected to your Windows 8 computer or tablet. 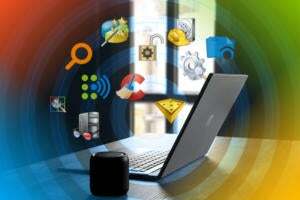 Generally, you use the Devices charm to print from a Windows 8 app and to manage your printers and other connected devices. 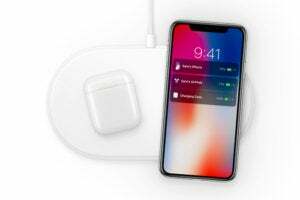 For instance, if you've got two or more displays connected to your device, Devices lets you control how the screens work. This charm gives you access to a wide variety of application-specific and system-wide settings. 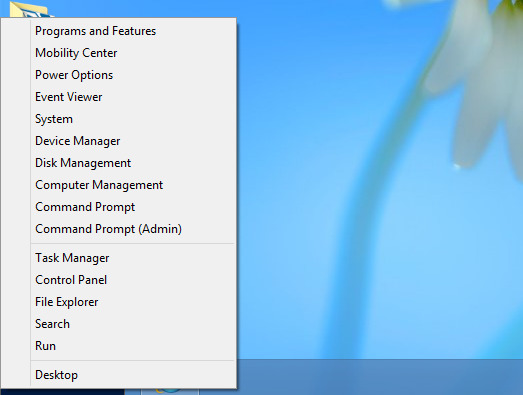 The top part is context sensitive, showing settings related to what you're currently doing in Windows 8. From the Start screen, for instance, you can change settings related to tiles, such as whether to show tiles for administrative tools. The bottom part of the Settings charm is the same no matter where you are; it lets you change global Windows 8 settings for your network, sounds, screen, notifications, power and keyboard. Click the "Change PC settings" link at the bottom of the screen to get to the new "PC settings" screen, which we'll look at next. This screen lets you customize how the most important features of Windows 8 work, including app notifications, search preferences, privacy options and more. The settings are all straightforward and self-explanatory. Just click the one you want to change and get to work. Go to the Personalize section, for example, to change your account picture and the background images for your lock screen and Start screen, and choose which Windows 8 apps should deliver information to the lock screen. One noteworthy section in the PC settings screen is "Sync your settings." 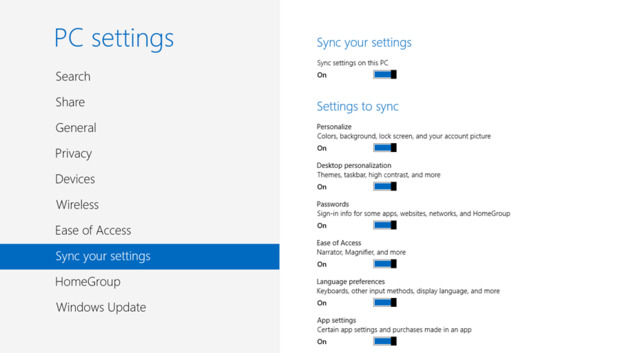 If you have multiple Windows 8 devices, this feature lets you sync some of your settings among them. You can sync your lock screen; account picture; Desktop personalizations; passwords for apps, websites and networks; app, browser and mouse settings; and so on. Simply turn on or off which items you want to sync or not sync. 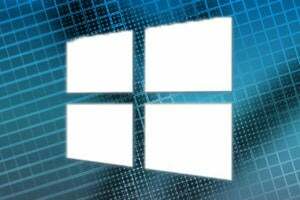 Windows 8 has a number of system-wide navigational features that are available wherever you are -- on the Start screen, the Desktop, inside a new Windows 8 app or in a traditional Desktop app. The Charms bar is one of them, and the old Windows standby Alt-Tab is another. Press the Alt and Tab keys on your keyboard simultaneously, and a strip of thumbnails of your running programs appears. While holding down the Alt key, keep pressing the Tab key until you come to the thumbnail of the program you want to run. Release the keys, and you'll switch to that program. Another way to switch among your running apps is to move your mouse pointer to the hot corner in the upper-left portion of the screen. When you see a thumbnail of your previous location, move the mouse pointer down. A black bar appears on the left showing thumbnails of your running apps. Click any to switch to it. Note, however, that even if you've got multiple Desktop apps running, this bar displays only one Desktop-related thumbnail at a time -- the last app that was opened full screen or the Desktop itself. You can also use the lower-left hot corner to toggle between the Start screen and the place you last were before going there. 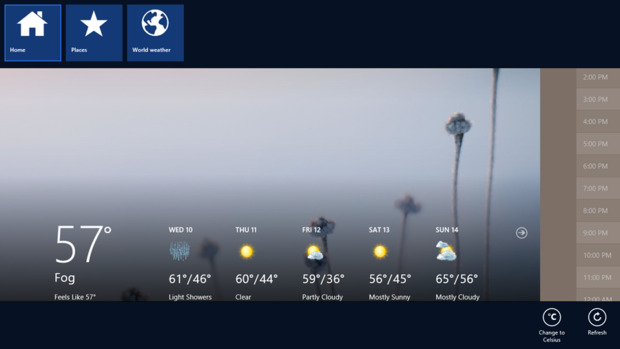 A hallmark of the new apps that ship with Windows 8 -- including Mail, People, Weather, Music, Bing, Photos, Maps and others -- is that they're designed to run in full-screen mode, and they don't display menus or toolbars. But if you right-click anywhere in the app, an App bar appears at either the top or the bottom of the screen, or both. The options available in the App bar vary according to the app you're running and what you're currently doing in that app. In the Weather app, for instance, the App bar lets you refresh the page, change between Fahrenheit and Celsius, navigate to other places you've chosen to display weather, and so on. Windows 8 includes two different versions of IE10: a Desktop app that's very similar to the Internet Explorer you're used to, and a new Windows 8 app. 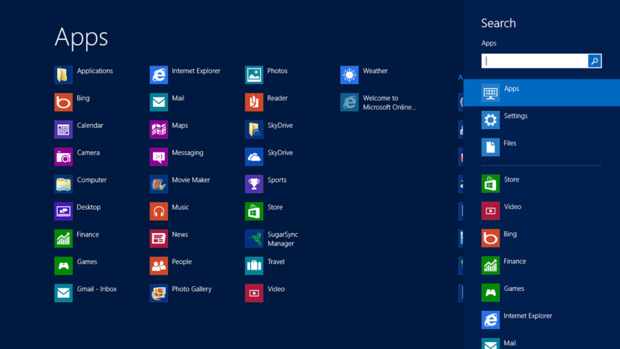 When you launch the Windows 8 version of IE, at first all you see is a Web page, with no address bar or other controls. Right-click to display the App bar, and two sets of controls appear. 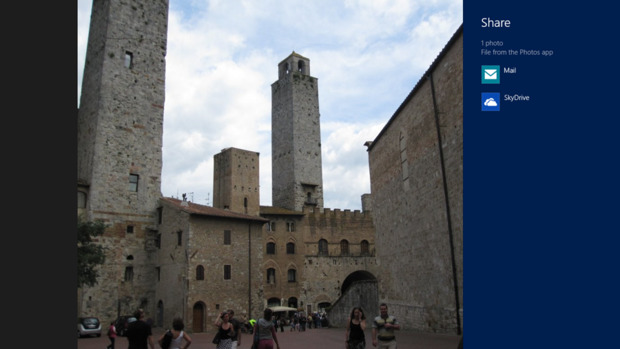 On the top are thumbnails that take you to recently visited sites, as well as buttons for launching a new blank tab and accessing more options such as closing all your tabs. At the bottom of the screen are familiar browser controls including an Address bar and forward, back and refresh buttons. 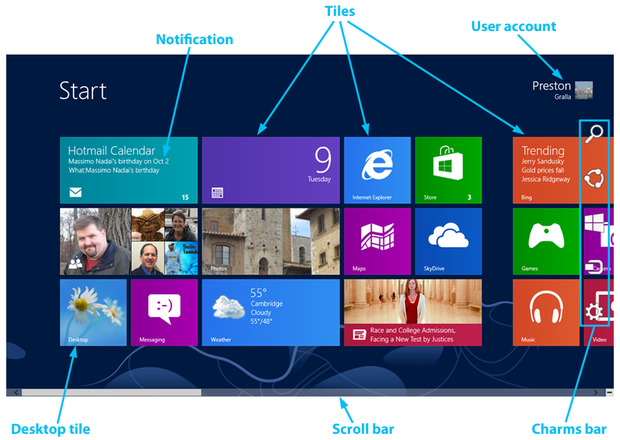 To launch a new tab in the Windows 8 version of IE10, click the + button at the far right of the upper App bar. A blank page appears with an empty address bar at the bottom, a list of sites you've visited frequently, and any sites you've pinned to the Start screen. Click a frequently visited site or pinned site to go there, or type an address into the Address bar. Called Windows Explorer in previous versions of Windows, File Explorer has been redesigned with a Ribbon interface, similiar to the one found in Word 2010 and other current Microsoft Office apps. The Ribbon is divided into several tabs that provide quick access to various file-management commands. The Home tab lets you copy, paste, move, rename and open files, among other things. The Share tab lets you share files and folders via email, by burning to disc and so on. 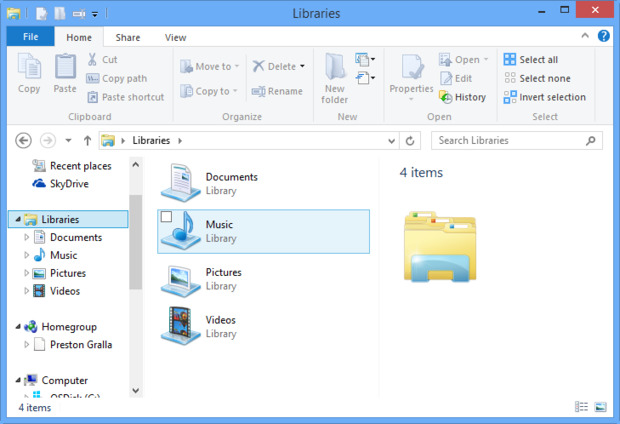 The View tab lets you customize how you display files and folders in File Explorer. And the File tab on the far left offers features such as quick navigation to frequently visited locations. This new feature backs up files stored in your Libraries, Favorites, Contacts, Desktop and other locations you want backed up. It also keeps interim versions of files so that you can retrieve previous versions of a file. You'll need storage media such as a USB drive to back up your files to, or you can back up to local network storage. 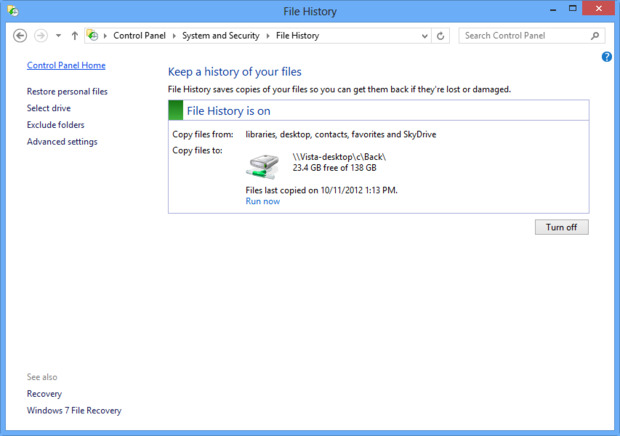 To turn on File History, type "Control Panel" at the Start screen, click the Control Panel icon that appears, search for "file history" and click the File History link that appears. Click the "Turn on" button and make any selections necessary, such as which drive you want to back up your data to. By default, the tiles on the Start screen seem to be randomly placed into groups, but you can group them however you like. To move a tile to a different group, just drag and drop it. To create a new group, drag a tile away from existing groups until you see a vertical bar, then drop the tile. To move a group to a different location on the Start screen, mouse over the bottom-right corner of the screen and click the − (minus) icon. All of your groups and tiles will minimize to small thumbnails. Right-click a group, then drag and drop it wherever you want it to be. Windows 8 apps normally run full screen, but you can run two of them side by side using a feature that Microsoft calls Snap. 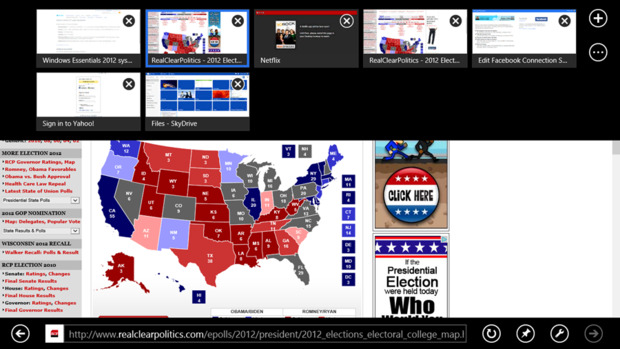 With both apps running, mouse over the upper-left hot corne and move your pointer down. Click and hold the thumbnail of the app you want to run beside the current one, drag the thumbnail to the right and drop it. The two apps will now be running side by side, with the one you just dragged appearing in a sidebar on the left. To resize the two app panes, drag the border with three dots on it to the left or right. 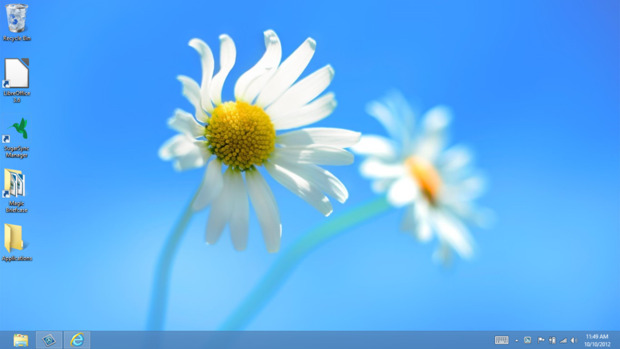 One of the biggest complaints about Windows 8 is that Microsoft killed the Start button on the Desktop, but a program called StartFinity Starter Edition from WinAbility Software adds its own Start button to the Desktop. 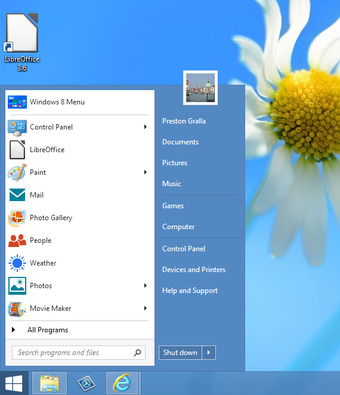 Click it, and up pops a list that looks quite similar to the old Windows 7 Start menu, with links to Documents, Pictures, Music, Control Panel and so on. You can also click Programs to see and run all your Desktop apps. Another third-party option is Start8 from Stardock. 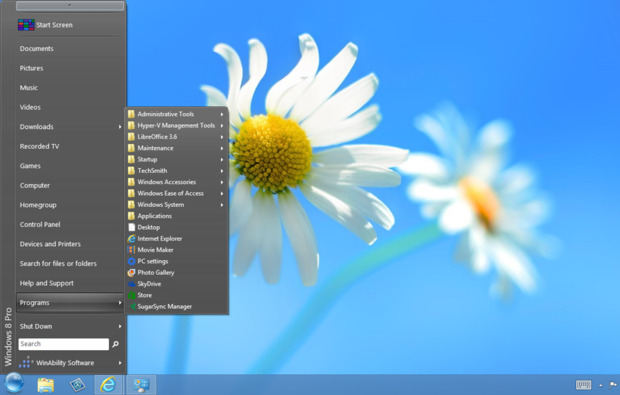 Although it works a little differently than the Windows 7 Start button (you press the Windows key to activate its Start menu), it offers familiar links to programs, Control Panel, Documents and so on, as well as a search bar for finding programs and files. 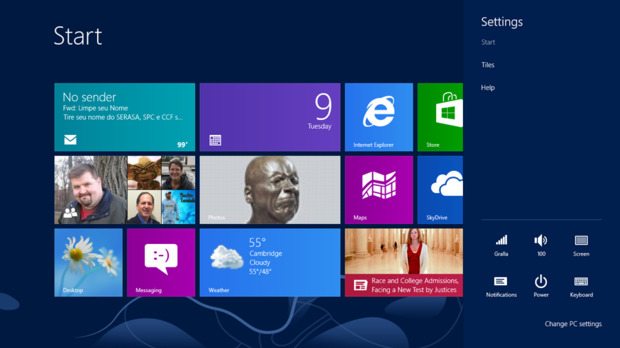 Start8, which costs $4.99, also lets you boot directly to the Desktop, bypassing the Windows 8 Start screen.